Convert thousands of images between such formats as JPEG, JPEG2000, PDF, RAW, GIF, animated GIF, PNG, etc. Apply correction settings to improve images quality. Resize pictures and fit them to video frame parameters or popular printing formats. Save most frequently used presets and watermark images. AVS Image Converter is a part of AVS4YOU package. Convert piles of images to all key formats at one go! 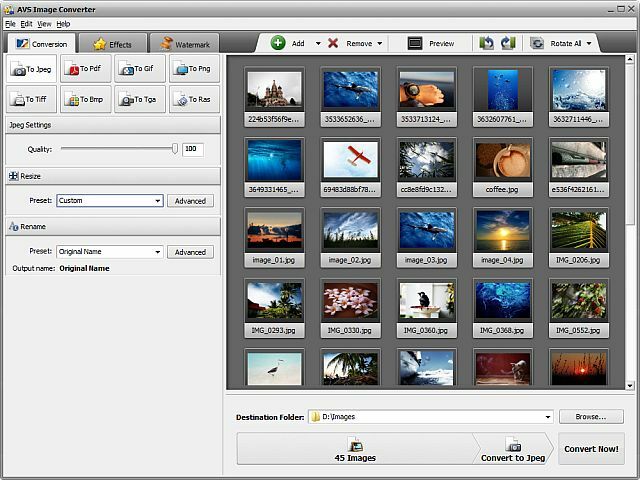 Convert a set of images to all key formats at one go with AVS Image Converter! Resize pictures and prepare them for future slideshows or fit them to popular printing formats. Select a logo and apply it to converted pictures as your personal watermark. Save most frequently used features as presets and next time convert images with the right mouse button even without opening AVS Image Converter. AVS Image Converter is is a part of AVS4YOU.com package. Register once at avs4you.com and work with all tools from the AVS4YOU.com package. Subscribe for $39/year or $59/lifetime. AVS4YOU tools let you easily rip, convert and edit audio/video files, edit images, burn DVDs, create ringtones, upload videos to portable devices, players, phones and much more! Convert BMP, JPEG, GIF Image to Icon. Qweas is providing links to AVS Image Converter 2.1.2.169 as a courtesy, and makes no representations regarding AVS Image Converter or any other applications or any information related thereto. Any questions, complaints or claims regarding this application AVS Image Converter 2.1.2.169 must be directed to the appropriate software vendor. You may click the publisher link of AVS Image Converter on the top of this page to get more details about the vendor.